Viticulture is present around the word in a large diversity of climates. The water availability in the soil and the quality of sunlight are two environmental factors that affect the fruit characteristics for winemaking. Ultraviolet (UV)-B radiation comprises a small fraction of sunlight that reaches the Earth’s surface, but has enough energy to cause large photobiological effects on higher plants. High UV-B increases metabolites with antioxidant properties as phenolic and volatile organic compounds in berries that improve oenological quality although affecting growth and fruit yield. Water restriction is a common cultural practice used in many wine regions to increase berry quality for winemaking and it is well documented that main effects are mediated by abscisic acid (ABA). Generally, ABA is a phytohormone that, besides to control stomatal aperture, regulates many physiological and biochemical processes of acclimation to adverse environmental conditions; and also controls grape berry maturation. Stress conditions and/or environmental signals generally increase ABA, and a promotive effect by UV-B has been found in grapevines. 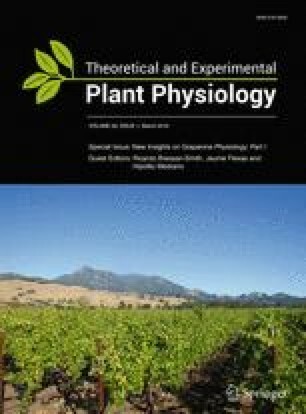 This review provides an overview of existing literature on the effects of UV-B radiation, moderate water deficit practices and sprayed ABA on grapevines (Vitis vinifera L.). The focus is on the physiological and biochemical aspects affecting growth, yield and quality for winemaking.